IMO that would definitely be considered "Wild Bay". BUT, let me check with my friend. I am not sure if the mare produced a black foal before she bought her or not. IF the mare did produce a black foal, then this is way easier. The mare was bred to my friend's brown stallion, twice producing bay foals. One being "Allusion", the one in the pics. The other was a full brother with full points. There was one more full sibling, but I cannot recall if he was bay or brown. No matter ... he wasn't "wild bay". Allusion is the only "wild bay" she produced for my friend. The brown sire could not possibly be the source for a wild bay gene ... obviously. So that leaves the mare. IF she did produce a black foal, then "Houston, we have a problem". If not (or if my friend does not know), then we're stuck. And this is a really bad example to use to try to discuss this topic. But I do have another example ... I think ... if this one can't work. I'll try calling my friend tonight to ask about a possible black foal. It's entirely possible that I'm thinking of a different mare, though. Even so, I did want to know if you thought Allusion would be considered wild bay. I've always thought the black point coloring had to be restricted to below the knee (to fetlock height, actually). And Allusion has really pale leg point coloring at the knees and hocks. So we've always been really torn on whether to call him wild bay or not. That horse is the absolute epitome of wild bay IMO. He has every single characteristics I look for in one. This is going to sound really weird... but I actually wonder if wild bays MUST be heterozygous black somehow. To find a wild bay without a chestnut parent has been virtually impossible for me, and I've looked extensively. Coincidence? Maybe. I personally do NOT believe wild bay HAS to be dominant to all the others. The reason I've done so much research has been in an effort to disprove that theory. Hey!! I sure wish I could put your screen name here together with your real name but nothing is coming together for me at the moment. And to be honest, while I'm a member of this forum, I really have not had time to visit, read, or post in quite a while. I just happen to still be subscribed to this particular topic and pop in whenever I get a notice that there has been a new post. I really should check in more often!! And that was really very nice of you to mention that I was "gracious and helpful" when you've contacted me privately. I do try to be nice when someone contacts me with color questions. Just as an FYI, neither of Allusion's parents is "red". Although his dam is gray, her actual coat color was bay. That much we do know. The other possible wild bay example that I have ... I think that one also has two black based parents (brown and bay, I think). However, that doesn't mean they are homozygous for black, of course. They could easily be Ee. Just saying they don't have a chestnut parent is all. Interesting that you don't think wild bay is dominant to the others. I admit that I've not done a lot of research on wild bays, but I cannot imagine that it would not be dominant in expression to bay and brown, though. Logically speaking, it would be dominant to bay the same way that bay is dominant to brown. But I'm all ears!! *Absolutely* interested in hearing your theory of how it might work!! Oh well that's interesting. But as you said, he could still be Ee. It's just that every one I've found has either had a chestnut parent or a gray parent (who often proved to be chestnut based LOL). I personally see ZERO reason, genetically, to believe that the genes dominance goes in the order of its resulting phenotypes. I know one of the reasons people believe wild bay is dominant is because it has the lest black. However I just don't see how that would matter genetically. If you look at them as separate mutations, IMO it could fall anywhere in the spectrum. I'm just of the belief that if it were dominant we'd see it far more often. But I've not been able to find proof for OR against hat theory as there are so few of them out there and even fewer with photographed parents. Now, I cannot speak to this as it relates to wild bay, but I can with regard to bay & brown. There is definitely genetic support for bay being dominant in expression to brown. But even without the genetic support, there is a lot of anecdotal evidence as well. I've seen many, many examples of bay horses who proved via progeny and/or testing to also have a brown gene. But I've never seen it the other way around ... brown horse that also has a bay agouti. As for the genetic support for this ... unfortunately that falls under privileged info. It is info that was shared with me by Michal Prochazka, and I don't think he has made it public yet. From what he explained to me (as I understood it), it is exactly the very nature of what he found that supports the dominance of the expression of bay over brown. I just cannot say exactly what that is/how it works until he has published or otherwise publicized it himself. And the general rarity of wild bay is precisely why you got my attention. It is NOT an expression that is seen very often; therefore, I could easily listen to theories as to why that's so. Like I said, I've not truly studied wild bay at this point, and that's probably due mostly to the fact that I don't see it often enough, so it really had not seriously piqued my interest ... yet. I was looking at some pics of some some Norwegian Fjords and I think maybe some Exmoor ponies were present, too ... cannot recall for sure. I was primarily looking and the Fjords ... for dun reasons ... the question that used to hound me was why do so many Fjords not seem to have very visible leg barring? Well, gee ... so many of them (with bay base coats) appeared to have almost no leg points ... like they have a lot of wild bay looking base color expression. AND the majority of them also appeared to have very pronounced expressions of pangare. So, I theorized at that time that many Fjords don't show leg barring very prominently due to wild bay and/or pangare causing very light leg coloring. And as something of a "passing-side-thought", I kinda wondered how big of a role pangare might play in the wild bay phenotype? Maybe none. But I did notice that at least some (most?) of the horses I saw that I considered to fit the description of wild bay appeared to have some sort of expression of pangare ... or at least a paler overall coloring. So my quicky theory was that maybe wild bay is actually *not* caused by another mutation of agouti, but instead is caused by a modifier that not only makes the leg points "less", but also lightens the coat a few shades. It was just a thought is all. And not necessarily a very well thought out thought, either. So take it with a block of salt. No... I have ZERO question about bay and browns dominance with regards to each other. But I think it's solely coincidence that the redder one is dominant, that shouldn't dictate that the even redder one (wild bay) would be dominant over THAT one. However I do think it's quite possible Fjords are mostly wild bay bases. Although they've been bred to be so light and adding the pangare' and the extreme dun they wouldn't HAVE to be I don't think. It bears looking at some Fjord crosses to see what's coming out when they're mixed with normal coloring. You mentioned wild bays having a lighter coat color... that's one of the things that indicates wild bay if I have any question. Also guard hairs in the mane and tail. I'm not sure of the root cause of it, but that does seem to just be part of it. I wish someone would do some research on it, even if only anecdotal stuff. But they're SOOO hard to find it makes it tough. I don't think I explained my quicky theory very well. I don't truly suspect pangare to be the real cause. It was something that jumped out at me initially, but it doesn't work. Again, I didn't explain that part very well at all. More on that later. Now, your mention of the guard hairs ... YES!! One of the things I/we noticed on Allusion was the presence of red (well, same as his orangy-red body) guard hairs along the mane and at the tail head!! SOMETHING is (further?) restricting the ability of black pigment to be produced ... not only in the upper portion of what should be the leg points, but also the guard hairs. And that's kind of where my pangare thing came in, because I could initially see it causing lighter coloring on the legs of the Fjords, but only because they already had the lowered leg points. But I don't *really* think it's pangare. It cannot be pangare, because pangare only affects red pigment (of the soft areas), not black. What we're talking about with regard to wild bay is something that apparently affects the distribution of, or the ability to produce, black pigment ... in the guard hairs and the upper potions of the lower legs. And it also seems to cause an overall lightening of the coat shade, I think. Initially, a "more aggressive" (more restrictive) mutation of agouti would seem the most logical. But as you're saying, why isn't it more common if that's the case? A separate modifier that's recessive? Honestly, I don't really know. I think it needs more research for sure! Have you noticed either dun factor (false obviously) or a very dun toned body color on some of these wild bays? I have. I always say "if it looks like a bay dun but it can't be, it's probably wild bay". I think it could be another allele of agouti and just be recessive to at least bay, if not also brown. If anyone had trouble with the link, simply remove the last / (after the .jpg), and it will work just fine. Or just click here (I fixed it) ... Wild bay? The expression of light guard hairs is certainly a trait that I would associate with wild bay, but not necessarily *only* with wild bay. Without seeing the rest of the horse (to see the leg points), I wouldn't assume wild bay. The mane by itself wouldn't seal the deal for me, though I certainly would wonder and suspect it possible. No ... I can't say that I have noticed that. In fact, I have generally noticed that paler coat shades are less likely to show primitive markings of any kind. And the tone of the coat color doesn't work for dun for me, either. At least not with the few wild bays I've seen. But that may be partly due to the fact that I've spent about 10 years destroying my eyes learning to recognize the subtle, but unique tones of the dun dilute colors/shades. So I can usually tell dun from "trying to look dun" fairly well most of the time. There are those that are really hard, though!! I just can't say that I've noticed those being wild bays. At least not that I can recall for sure. As a side note, I don't believe in "dun factor". I know it's the long accepted term for the markings, but it implies that the dun gene causes the primitive markings, and I don't believe it does at all. And I don't think the researchers at UC Davis think they are put on by the dun gene, either. I call them primitive markings because they can be seen on horses of just about any color. I know you know this, of course. I'm just in "informative mode" for anyone else who might be reading. I guess I'm not quite sure if that could be possible based on what I know of how agouti works (functions). I've been mulling this over most of the morning trying to come up with how it could work that way ... how it could act to restrict even more black ... how it could block the production of even more black than bay and brown, yet not be able to do so in the company of a bay or a brown agouti gene. Well I just don't believe the end phenotype has any bearing on the dominance in a case like this (obviously not the case in the case of an incomplete dominant, which we're not dealing with here). As far as the primitive markings and dunnish body tone, it may be just because you study dun so much. I've run into it several times. I'll look for some examples tonight. Alecia Albury here - not that it matters - it was just a dun discussion...You've changed your site!! I must go mose-E on around it! I just remembering being very surprised at your replies that were complete with photos of progression and everything! It was refreshing to have someone back up their stuff (so-to-speak)! I very much prefer the term primitive markings for that reason, and very much like your way of explaining about dun factor etc.. I see it as lots of horses can have them, but dun usually just makes it very easy to see, or something like that! As an aside, I get confused about some of the spanish horses supposed to be having dun, when they don't test for dun (well the way the test is right now) Why can't they just show primitive markings well, why does it have to be a different sort of dun?? IMO with the very limited stuff I have seen on the dun in spanish, the reason its another form of dun its because it looks acts and passess EXACTLY like dun does. if it was just counter shading I personally think that it would act like it does in other breeds. rarely passed on and little to no actual dilution. The reason it doesn't test to be dun in the Spanish horses is because it is not dun. I'm not buying that they have a different mutation. Why don't they have the right coat dilution? It's not a different/separate mutation. It's just the cream dilution (where there is a dilution to the coat) with pronounced primitive markings from what I've seen. The Spanish horses, in general, have very strong primitive marking expression. Plus, there are a LOT of grays in those breeds, and it's quite common for grays to show primitive markings ... especially those with agouti (and more especially when they have "At"). 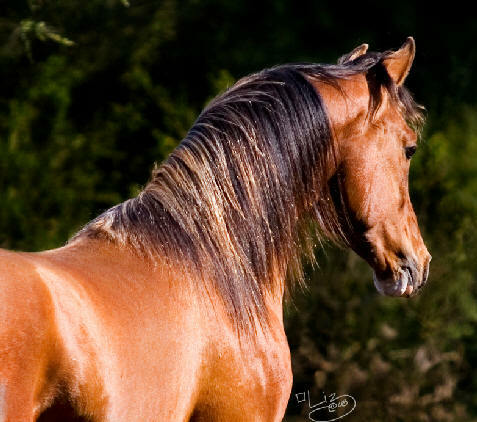 I found a red dun Lusitano on-line (in Portugal or Spain, I think? ), but I've not seen a dun dilute Lusitano here in the U.S. yet. Not that I've been searching or actively out on forums/lists watching for them, mind you. There may be some here ... I don't know. I'm just saying I've not seen them myself yet. So far, every "dun" Spanish/PRE/Andalusian that I've been shown has been brown (foals with brown agouti inspired primitive markings), gray, or buckskin (some of which are brown based). Besides not having the right look to their primitive markings and lacking other dun traits, they don't have the right dilution to their coats. They have classic cream dilution. They produce palomino and double cream dilutes, but not red duns and grullas. Why is that? Simple, they are cream dilutes only! They just happen to have very nice expression of primitive markings. If anyone has found a true dun dilute Spanish/PRE/Andalusian, I would be thrilled that it exists in those breeds! But so far, I have not seen any evidence that it does ... except in the Lusitano breed, that is. And even most of the "dun" Lusitanos I've seen have been buckskins. Hey, I wonder if any Sorraias have been tested? They are all dun dilute, and they are supposed to be the forerunners of the modern Spanish breeds, I think. If they test to have the same dun mutation as the rest of the horses, then wouldn't that prove that the Lusitano/PRE/Andalusians should not have something different than all the rest of the breeds who do test to have the dun gene? Aio - red dun Lusitano. You can click on the little numbers under his pic to see more pics, including pics of his markings. Scroll down to find him, but ignore Xantio (brown buckskin, not dun). Xerez is probably buckskin, but there are not enough pics of him for me to say with 100% certainty. I'm wondering how many of these Spanish horses have been tested for the cream dilution? And how many of those who showed some sort of dilution to the coat came back as not cream dilute? Check this out. Dorsal shots of the same horse ... summer pic on left, winter pic on right. Dun dilute? Dun dilute or Not Dun dilute? ... *THAT* is the question! I saw no dun to the first, and yes to the pally, but of course I don't really know! The first looks bay with a dorsal? Dunno, but I don't think dun?? Looks more buckskin? I can't see pics, just some links and little red 'x's. Black, bay and brown are all black based meaning that they can produce black pigment (eumelanin). Black based horses all carry at least one dominant extension allele (E). The difference between black and brown/bay is the agouti gene (Aa). Agouti turns off the production of black pigment in melanocytes, reverting them to producing red pigment (pheomelanin). Black carries the recessive agouti mutations (aa) so they are only black pigment. Bay horses carry one or two copies of wild-type agouti allele (A), which is dominant. It causes the melanocytes on the body to produce red pigment instead of black, leaving the points black. Brown is a separate allele of agouti (At) that only restricts the black pigment from the soft spots (flank, belly, armpits, muzzle). At is recessive to A. This thread is a wealth of information, but unfortunately about 2/3 of the images links are invalid now (Aug. 2012). Too bad as there are several of the images I would love to see (especailly the range in brown coats). Also can anyone tell me if the brown paper was ever published and if you if it is available online to be read.